Max Verstappen, the Netherlands’ greatest sports hero of the day, seems like a pretty ordinary guy. A “boy next door,” you might say. Yet, despite his laid-back personality, there’s no doubt he’s a phenomenon - with an unprecedented talent that’s made him the youngest Formula One racer to ever win a Grand Prix. On top of that, he’s a true team player who wants to reach the top by working with the right people and the best technologies. And he’s pretty outspoken about his opinions! So, it’s no surprise that everyone wants something from Max. But Max chose Exact, because he could see that it was a match for him. That’s how we came to be a “proud partner of Max Verstappen” for the last few years. Sounds pretty good, right? So, what makes Max and Exact the perfect match? What is it that attracts Formula One racers to Exact (Max’s father, Jos Verstappen, was also connected with Exact)? Of course, we’re both Dutch. And, of course, we both want to be the best. But there’s more. It has to do with our mentality. We want to move the boundaries by constantly pushing just a little harder. We use innovative technologies to achieve our goals and ambitions. We believe in our own abilities and keep going when we know we’re doing the right thing. That’s classic Max. It’s also classic Exact. 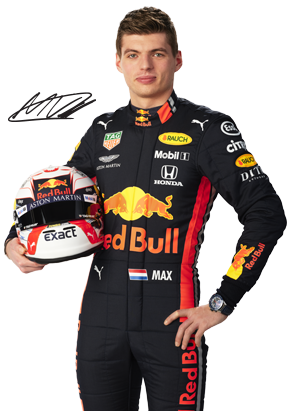 Max is not only at home behind the wheel of his Formula One car, he also feels right in his element as the star of a commercial or during an interview. Of course he’s got a busy schedule, but every time we get the chance to work together, the results speak for themselves. Each of our productions with Max rests on one of the following three pillars: mentality, innovation or fun. From commercials about Exact’s innovative technologies, to interviews at events, to test-driving Exact’s own Grand Prix circuit: Max does it all with focus and ambition. And that’s plain to see. Just look at the examples. Not just in Formula One, but also in the development of Exact software, innovations are taking place at lightning speed. Artificial intelligence, machine learning... Max and Exact are always curious about innovations that help them achieve their goals. In collaboration with Kingsday and The Ambassadors, we made a series of funny commercials to put Max to the test. Exact Live, the largest business event for technology and software in the Benelux, introduces thousands of people to the latest technologies. Max is always curious about the latest innovations, but we decided to put him to the test with tech from way back in the day: a tape recorder, a Walkman... Turns out that Max definitely belongs to a younger generation. So, you’ve got great photos of Max Verstappen. And you’ve got some high-gear background graphics. But you don’t have any way of actually filming the Formula One car. So, how do you make that innovative video you wanted? The answer is computer-generated imagery (CGI): the perfect solution for combining film and computer-generated images. We used this technique for a special production with Max to promote New Accountancy, our flexible, reliable software for accountants. After all, if you stand for innovative products, you have to communicate them with innovation too! He drove his first laps on the first Dutch street circuit, developed by Exact. After that, he gave an extended interview to F1 journalists Jack Plooij and Wilfred Genee. There was also a live link with Christian Horner, team principal of the Red Bull Formula One racing team. As the ambassador for Exact, Max is a very welcome guest at Exact Live - especially because it gives our customers and partners a chance to ask him questions during a special Q&A session. Where does your passion for winning come from? What role does technology play? How do you train for a Grand Prix, and what do the people around you mean to you? From the cockpit of his car, Max offers some insight into his life as a person and a racer, during a series of interviews with F1 journalist Jack Plooij. Mix Reality is a combination of the virtual and real worlds. Because it enables us to create incredible visualizations, it’s a great way to share information - not just for Exact, but also to race alongside Max on various F1 circuits. We can’t make it any more realistic, but we can make it more fun: for example, by creating the first Dutch Grand Prix in MR! As Max’s partner, we wanted to post something fun on social media each week. That’s why we developed Funk-E the Max: the comic strip featuring our superhero Max, with a different story to go with each Grand Prix. When we found out that Max was actually our comic strip’s number one fan, we decided to create a bundle. That’s how our superhero got his own comic book.